As winter hopefully moves into spring, preparations are well underway for our 2019 Show. We are keeping our fingers crossed for a repeat of our bumper 2018 Show which took place on a warm, sunny day and had the best crowds for many years. As always, there will be a wide range of traditional agricultural and horticultural exhibitions and classes, together with handicrafts and produce. There will be a host of special attractions, children's entertainments, trade stands, food and refreshments, and much more. New for this year, we are hoping to get sufficient interest for a "Farmers' Market" area. We would like to thank all sponsors, members, exhibitors, and other supporters for their continued help and support, as without their contribution, we would not have a Show to present for the public’s enjoyment. Also a big thank you to all those who give up their time throughout the year to put together all the arrangements for the Show, and to those who spend a week setting up the show field and clearing up afterwards! 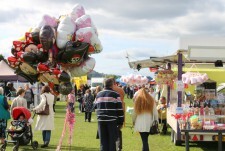 Keighley & District Agricultural Show has taken place on the first Saturday in September since the 1950s and provides an entertaining and fun day out for all the family. Livestock, horses and other animals, large and small, are interspersed with horticulture, handicrafts, children's amusements, trade stands and many special attractions. A day definitely not to be missed.